Most people view Egypt as a peaceful state. The country has a deep history full of fantastic stories about Pharaohs and pyramids. To this day, people travel to the nation that is at the center of the map of the world all of the time to see the Great Pyramids and the deep history that the country has to offer. However, right now Egypt is known as a state full of conflict. With the cost of living in Egypt skyrocketing recently, in addition to evidence of corruption in the government, Egyptians have lost their patience with President Mubarak and his government. As a result, a protest broke out. The politicians in Cairo were run out of town. Mubarak set a curfew for the country beginning at 6pm Friday night through 7am Saturday morning. The police forces were quick to the scene to keep the unruliness down. However, the people of Egypt did not respond accordingly and thus the army had to take the streets in tanks. In Cairo and Alexandria, police stations and cars were burned. But the problem is the people of Egypt want Mubarak out of office. After thirty years of him being the ruler of the state, the people have finally had enough. Obama told Mubarak to make good on his promises. He told the Egyptian president to give the people the rights and freedom that they are fighting for or else the conflicts will only escalate the more they are suppressed. Mubarak responded saying that he would give the people their rights so long as they respect the laws of the state. However, Mubarak’s announcement that he was going to overhaul the government disappointed the people who were hoping he would resign. Consequently, a riot broke out. 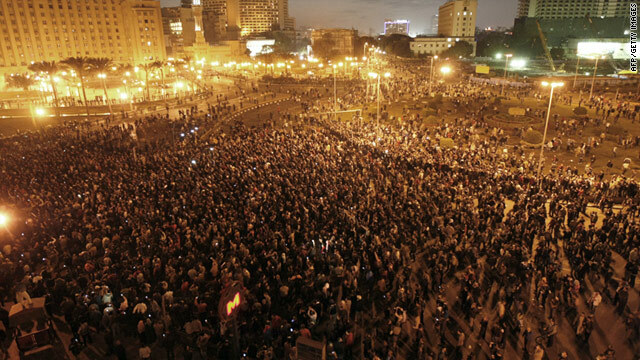 Since Tuesday, the people of Egypt have been protesting and still they have not gotten what they want: the resignation of President Mubarak.